Just when the home building industry seemed to be bouncing back, news from California raises troubling questions. The California Building Industry Association says its members reported a significant drop in traffic to their developments in July because the state stopped taking applications for a $10,000 tax credit for new home buyers. The $10,000 credit was authorized by the state legislature last February as a way to jump start California construction jobs. The credit, coupled with the $8,000 federal new home buyer credit, had been a big reason why builders in California saw a jump in sales this past spring. Everybody wants to know if we have hit bottom. There are three indicators suggesting we have—and three suggesting not. The good: prices in many markets have fallen below replacement cost (which is a pretty robust fundamental in the absence of population declines). Morris Davis at Wisconsin has shown that rent to price ratios have returned to be more in line with long term ratios, and given how low mortgage rates are, this is comforting. And resale inventories in California have dropped to under 4 months. On the down side, we may have a lot of foreclosed houses coming at us in the next year. 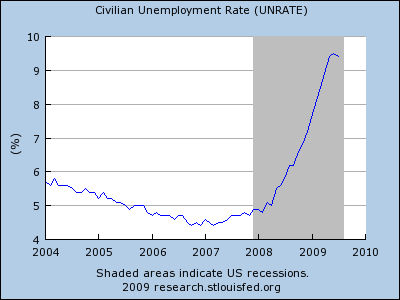 The employment picture is still atrocious. And if rents keep falling, prices will follow. I would also guess that the first-time homebuyer tax credit is time-shifting sales, rather than raising them for the long term, but we shall see. It's funny how rising asset prices are always "good" and falling prices are always "bad". More people need to study Warren Buffett's investment philosophy, because he considers low prices to be "good" and high prices to be "bad". As Warren would say, "The price you pay determines your rate of return." I hate to be the bearer of bad news, but as I'm sure you're already aware, almost all data seems to be indicating a bottom in housing. Despite the claims of the Calculated Risk blog (which I have echoed), the bottom appears to have occurred simultaneously in permits, starts, sales, and prices. The bottom also appears to have occurred simultaneously in nearly all parts of the country. 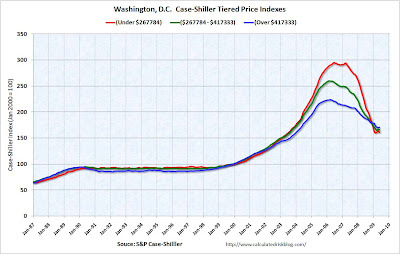 The S&P/Case-Shiller seasonally-adjusted home price index shows month-over-month increases in price for 15 of the 20 metropolitan areas it tracks, including here in the Washington, DC area. 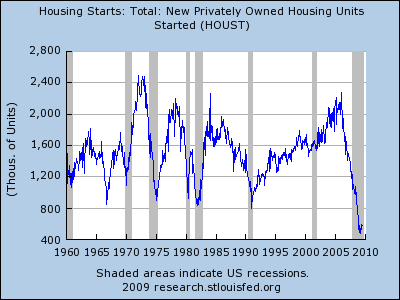 The bottom in housing is coinciding with the bottom of the economic cycle (i.e. 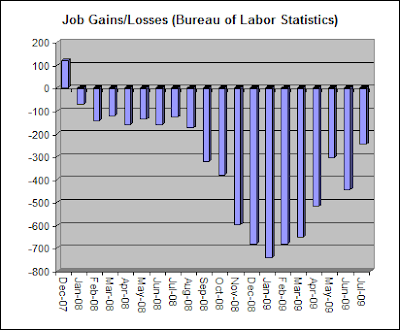 the end of the recession). There is a somewhat strong possibility that the $8,000 first-time home buyer tax credit, which ends November 30, is creating a false housing bottom. Low mortgage rates are also stimulating housing demand. Mortgage rates today are lower than they were earlier in this decade when they helped fuel the housing bubble. These historically low mortgage rates are likely to remain low for some time, as the Fed and Treasury do everything they can to strengthen the economy. Just as the Fed happily encouraged a housing bubble to stimulate the economy after the 2001 bubble burst-caused recession, I fear it will happily encourage another bubble to stimulate the economy after this one. As the stock market demonstrated earlier this decade, a new bubble can form before the previous one completely deflates. 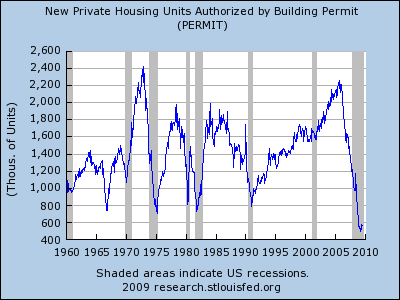 The big question is, what is the primary driver of current housing activity? Is it the $8,000 tax credit, which will go away soon, or is it the historically low interest rates, which won't? The Cash For Clunkers program, and the fact that housing activity is much stronger at the low end of the market, suggest that perhaps the $8,000 tax credit is the primary driver. Low mortgage rates should equally encourage sales of all conforming mortgages, regardless of price. By contrast, the tax credit should heavily favor low-end sales. This is because an $8,000 tax credit is 10% of the cost of an $80,000 house, but only 2% of the cost of a $400,000 house. The fact that new home buyers are currently making up a disproportionately large percentage of home buyers is further evidence of the first-time home buyer tax credit's effect. 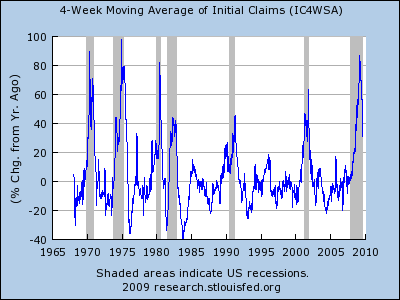 That said, as the tax credit stimulates housing activity and prices, it may change market psychology. Rising prices and low mortgage rates may then encourage others to jump on the bandwagon, causing yet another housing bubble before the current one has fully deflated. I can't predict the future, but this is a possibility that worries me. What could prevent such a scenario? If Nouriel Roubini's warning that the economy may experience a double-dip recession comes to pass, then that will likely knock the wind out of the housing market a second time. However, the upward sloping Treasury yield curve—the most reliable and far-sighted leading economic indicator—suggests this will not happen. Rebecca Wilder expects home sales to surge in the next few months as the end of the tax credit nears. Due to data lag, we likely won't know until spring 2010 whether home prices continue falling after the tax credit expires. In the Washington, DC area prices were up 2.2% (seasonally adjusted) in June compared to May; Annually prices are down 11.8%. President Barack Obama will announce the nomination of Ben Bernanke to a second term as Federal Reserve chairman on Tuesday, opting for continuity in U.S. economic policy despite criticism in Congress of the low-key central banker's frantic efforts to rescue the financial system. Mr. Obama's decision had become a subject of growing speculation and uncertainty in financial markets and in Washington policy circles. The president called the Fed chairman to the Oval Office this past Wednesday to offer him another four-year term. 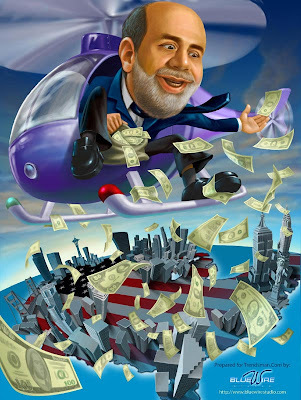 Mr. Bernanke then flew off to Wyoming where he gave a defense of his controversial policies at the Fed's annual meetings in Jackson Hole. 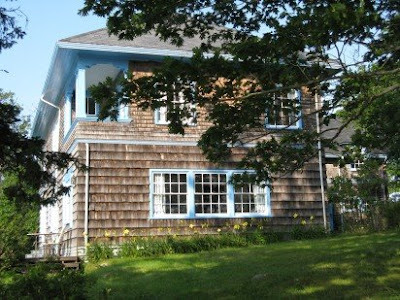 Mr. Obama left for Martha's Vineyard, Mass., where he will deliver the news Tuesday with Mr. Bernanke at his side. Mr. Bernanke is seen by supporters inside the administration and in markets as a creative and steady hand who helped to keep the financial chaos, which became especially dangerous in the past year, from becoming much worse. White House chief of staff Rahm Emanuel said the president credits Mr. Bernanke for "pulling the economy back from the brink of depression." The way to get rich. Will dump cash your door. Who works at the Fed. A number of times I have heard journalists—who helped cheer-lead the housing bubble and who regard any price correction as a bad thing—falsely claim that the housing bubble began around 2003-2004. After all, that's when the bulk of the sub-prime lending began so that must be when the bubble began. A look at the inflation-adjusted data, however, shows that the bubble began growing in 1998 and we were clearly in mild bubble territory by 2000. The extensive sub-prime lending that occurred in the middle of this decade was therefore a result of, not a cause of, the housing bubble. That said, the extensive sub-prime lending allowed the bubble to last longer and grow bigger than it otherwise would have. In summary, the bubble did not begin in 2004 and sub-prime lending did not cause the bubble. A gloomy U with a long, flat bottom of weak growth is the likeliest shape of the next few years. They also have a discussion about the housing market here. Cato Institute Senior Fellow Randal O'Toole discusses urban planning and suburban sprawl. Just like in retail, where the big bargain stores are showing gains, only the low end of the housing market is moving. ... I spoke with Spencer Rascoff of Zillow.com today, who claims, "this is not a real recovery." 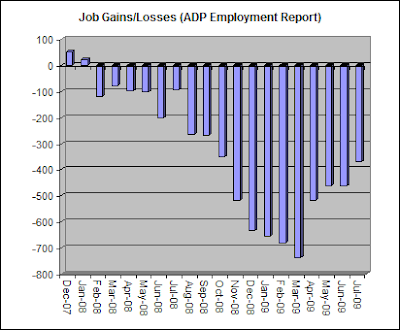 Higher sales on one end of the market do not a full recovery make. While the proportion of foreclosures started on borrowers with subprime adjustable-rate mortgages fell dramatically in the second quarter, foreclosure starts on traditional prime fixed-rate loans saw a dramatic increase. Here is Zillow.com's estimate of ten years' of home values on Kent Island (specifically Stevensville, MD) on the Chesapeake Bay. Give it time. Prices are still falling. 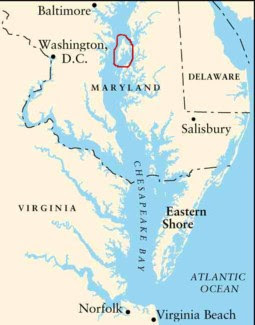 Kent Island is where the Chesapeake Bay Bridge crosses. It's circled in the map below. The only downside (besides the current price): Mapquest says a commute to DC takes roughly an hour each way. Anybody know of good jobs available in Annapolis? Robert Shiller: "There could be another bubble. Absolutely. There could be." ...But the market is predicting flat housing prices over the next five years. It's a 10 minute interview. People still have something of a bubble mentality. They want to get in now, when things are cheap, because they expect that we'll return to the housing price inflation of the 1990s, if not the last decade. Her entire blog post is well worth reading. You can't go anywhere without hearing people talk about "the real estate bubble." Such talk drives me to distraction, and I'll tell you why. It's because there is no real estate bubble. Bubbles are for bathtubs. Despite a thousand articles in Sunday newspaper real estate sections, the bubble is a myth. With all the competition in the market for mid- and low-priced homes, Yun said there are reasons for potential homebuyers to be optimistic about the current market. What is this statement supposed to be? Spin. More Spin. 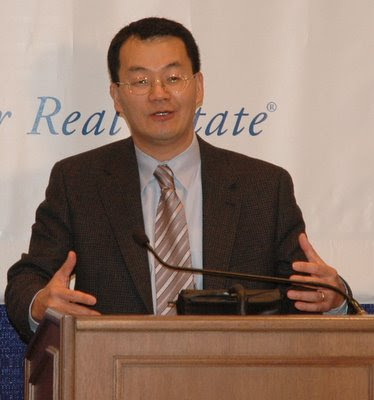 Another inane statement from Lawrence Yun, who is the Chief Economist for the National Association of Realtors. Here's an interview with Karen Weaver, one of the Deutsche Bank analysts who predicts that 48% of all mortgage borrowers will be underwater by 2011. The obvious takeaway of falling home prices and being underwater is what it does for defaults. But there's a bigger implication, which is that when we look at the economy over the past decade or two, it's been very much a consumer economy. What has been driving the consumer hasn't been gains in incomes. What has been driving them is easy credit and rising home values. And the fact that their home price was rising and they could borrow against that through home equity lines or loans or refinancing, it augurs for a very different economy going forward if people don't have that option. "In the second half of 2009, home values are going to continue to decline. Foreclosures are going to keep making up a significant part of the sales, probably about a quarter of all sales in the back half of 2009 nationwide will be foreclosures," says Rascoff, adding, "I think you'll have those homes clear off the market but new foreclosures come on the market right behind them." Rascoff believes we are a full year away from a true national bottom in housing, but even then, he says, don’t expect to make money fast. "You're not going to see a return to rapid appreciation from a couple of years ago," he opines. "This is probably going to be an L-shaped recovery where home values stay relatively constant once they hit the bottom." The foreclosure plague continued to devastate last month. The jump occurred as several foreclosure moratoriums phased out. They were initiated by many states to give the administration's foreclosure-prevention efforts time to work. But for many help did not come: The modification and refinancing programs have met with less success than hoped. Troubled Colonial BancGroup will be bought by rival BB&T Friday, the government said after state regulators closed the bank whose assets had been frozen by a federal judge. The failure of Colonial is another blow to the FDIC trust fund, which has had to cover 77 bank failures so far in 2009 — including four more late Friday. Today, the warehouse lending market is decimated. In 2007 it was worth an estimated $200 billion; now there is just $25 billion available — 25% of which belongs to Colonial. With Colonial's failure, those funds could become even more scarce. There are several reasons landlords may be willing to make a deal these days. Eighty-eight percent of property owners who participated in a recent Rent.com survey said that job losses are contributing to vacancy rates. Fifty percent said would-be tenants can't afford rent or are trying to save, and 45% said that the trend of more people doubling up with roommates is causing units to sit vacant. 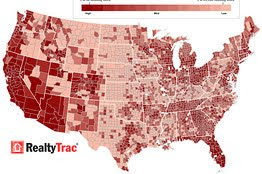 The survey polled owners representing 3,192 apartment communities throughout the country. And yet another survey by TransUnion, which screens credit for property-management companies, found that half of property managers are having difficulty locating qualified renters, compared with last year. Eighty-one percent are concerned they won't find reliable tenants for the rest of 2009. Lessors of real estate are earning significantly less so far this year, according to Sageworks, a financial information company. Profits are falling, company research shows, and empty units cost money to maintain. Personally, in my apartment complex in Centreville, Virginia, I'm surrounded by empty units. Still, my landlord is trying to slightly raise my rent above the going rate for new tenants. 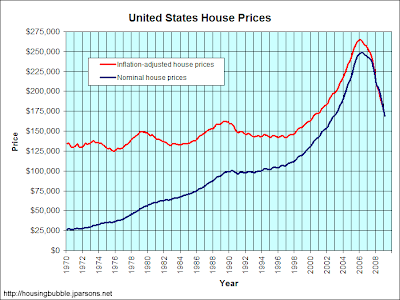 As explained in our earlier papers, home prices have typically risen at approximately the rate of overall inflation over the course of the last century. Keeping with economic theory, which contends that a home’s sale price is derived from the rents it can generate, home prices in the United States have also moved in line with rental prices. Beginning in 1995, however, this seemingly stable relationship between home prices, rents, and inflation radically diverged from the historical trend. Home prices shot up while rents continued to move in line with inflation. 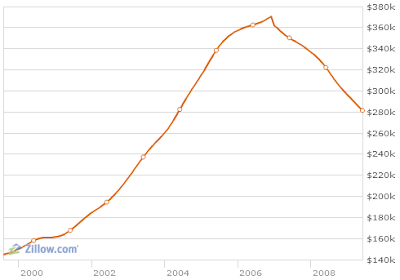 Where the ratio of median sales price to median annual rent had hovered close to 15 to 1 in recent decades (i.e. it took $150,000 to buy a house that would rent for roughly $10,000 per year) at the peak of the bubble in 2007, it went above 25 to 1 in many inflated markets. For purposes of analysis, this paper treats a home price that is 15 times the annual rent of a comparable home for rent as being at an equilibrium sale price, and defines a bubble market as one in which the ratio of price to annual rent exceeds 18 to 1. The paper also compares the current monthly costs of owning and renting. Can a household that buys a moderately-priced home today expect to gain equity within five years? Short answer: It depends on where you live. Full answer: Read the paper here. Via Calculated Risk, Freddie Mac says the housing recovery is "largely seasonal." Do you agree? 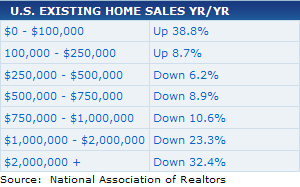 Will home prices continue their decline once the spring/summer selling season is over? 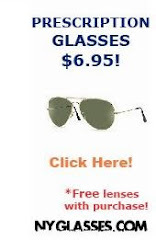 I'd rather pay more money. 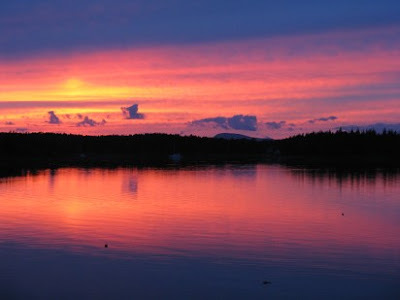 In answer to David's earlier question, I was in Maine. 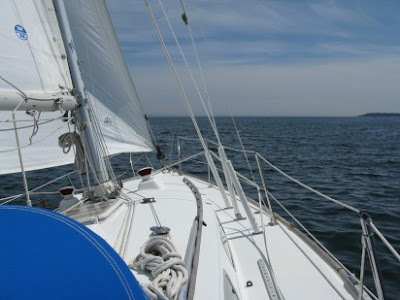 Unfortunately, the weather was lousy except for 3-1/2 sunny days. I've had no TV, Internet, or newspaper for the past two weeks. 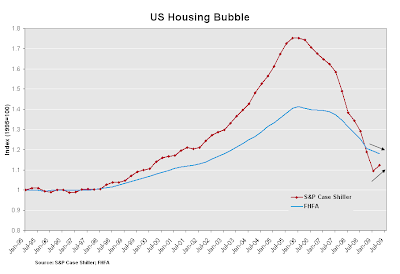 I'll get back to blogging about the housing bubble as soon as I find out what's been happening in the world. If anyone wants to fill me in, consider this a bits bucket post.